This book is a prime example of why I love Book Group. I would never have read a Cormac McCarthy, ok it would be unlikely rather than never, unless Matt hadn’t put this on his list of five (of which he had some other brilliant sounding books which I have been on RISI for) though I have seen ‘No Country For Old Men’ and loved it I wasn’t sure that I would read anything by the actual author of the book. The Road is a tale of an apocalyptic world, you are left to your own devices as to what might have caused it, a burnt America where you follow a father and son as they travel endlessly in one direction looking for the sea. On their journey they must beware of anyone as some remaining humans have become carnivores (some of the most shocking scenes in the book) searching for humans they can stockpile for flesh. The tale of the father and son on this long journey is tense and heartbreaking, they have little hope of finding food, allies or civilisation and the boy asking ‘Am I going to die today?’ was incredibly moving. 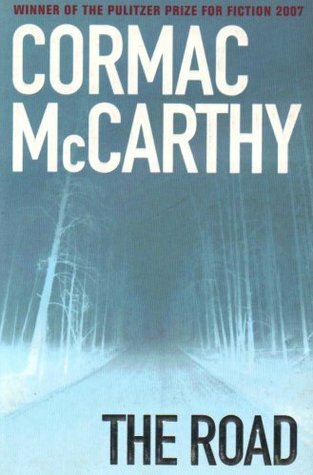 McCarthy uses his language like the landscape it’s a sparse novel to match the sparseness of the scenes in which it is set the prose stripped down like the lands upon which they walk. I can totally understand why this book has been such a huge success, it manages to effortlessly capture your fears of what could happen to the world, it’s a book set in a time of no hope, a book set in a world of fear and yet you read on. Though they are walking through endless grey and dust he tells the story in such a way that you are hooked and cannot help but read on. I actually read this in one sitting and I have never said this of any book before but I think it’s the best way to read it. It has no chapters anyway and before you know it you’re engrossed and four or five hours have passed. This is a must read novel. I can say nothing else.